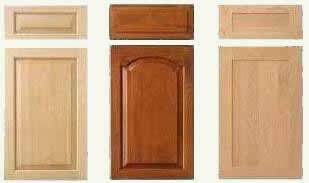 Kitchen cabinets and bathroom vanities are not inexpensive products. The cost of kitchen cabinets can be more than half of a total kitchen remodel budget. If you are a DIY home handyman, have basic wood working skills, can draw (consider using one of the many Home Design 3D software packages that are available) a layout sketch and some patience, you can save thousands of dollars by making your own kitchen cabinets or bathroom vanities. A home improvement with some sweat equity. Cabinets used to be build on site and were custom made for each home. As labor increased, and craftsmen who could actually create cabinetry began to disappear, new businesses appeared with manufactured cabinets (see Figure 1) that could be installed in less than a day in most homes. Manufactured cabinets actually require a lot more material than built on site cabinets. However, for the building contractor, pre-made cabinets provide greatly reduced skilled labor costs which dramatically out weights the cost of the additional material. There are no backs, nor are there sides when walls are present. The units are not constructed in modules in the manner that a manufactured cabinet is made. This saves countless dollars in material and as it is your labor, your cost is dramatically reduced. This article will discuss kitchens, because they are larger and somewhat more complex then bathrooms, however the construction techniques described can be used for bathrooms, laundry rooms, bedrooms, garages or any other place in your home where a permanently constructed cabinet is appropriate. READ All Of THE INSTRUCTIONS THOROUGHLY BEFORE STARTING! Besides basic hand tools it is best if you have a table saw for cutting the large pieces of plywood or particle board although a circular saw can be used. A reciprocating sander will save a lot of manual sanding effort and an electric drill is almost a must. Cooktop and separate oven or range and their placement and size. Will you have a dishwasher? If so, portable or built in? Ventilation: If it is through the upper cabinets, space must be allowed for duct work. 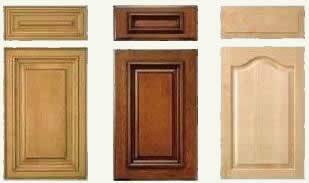 Cabinet finish: The fascia of the cabinets can be made using particle board with a laminate veneer or plywood with a wood veneer. Plywood with a wood veneer is more expensive. 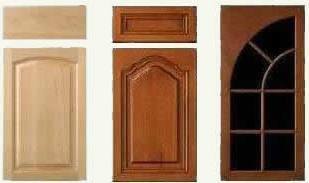 Doors & Drawer fronts: Cabinet doors and drawer fronts can be purchased or made (see Chart 1). 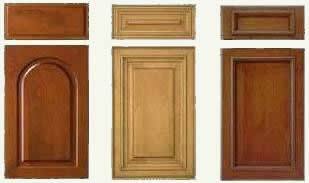 If you are purchasing doors and drawer fronts it is important to know what the exact dimensions of your cabinets will be. Once you have determined the size and positioning of your major appliances and answered the other questions you can commence with the layout of the cabinets. Cabinets are divided into 3 major categories. Base Cabinets - these are the cabinets that sit on the floor. 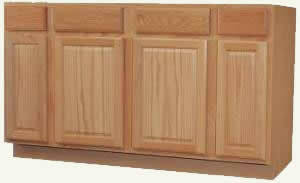 Wall Cabinets - these are the cabinets that are mounted on the wall above the countertop. Floor to Ceiling Cabinets - these are usually installed as pantries, housings for built in ovens or general purpose closets. They do not necessarily go all the way to the ceiling, but in most cases the top of this style of cabinet will line-up with the tops of other cabinets. Additional information on building countertops.